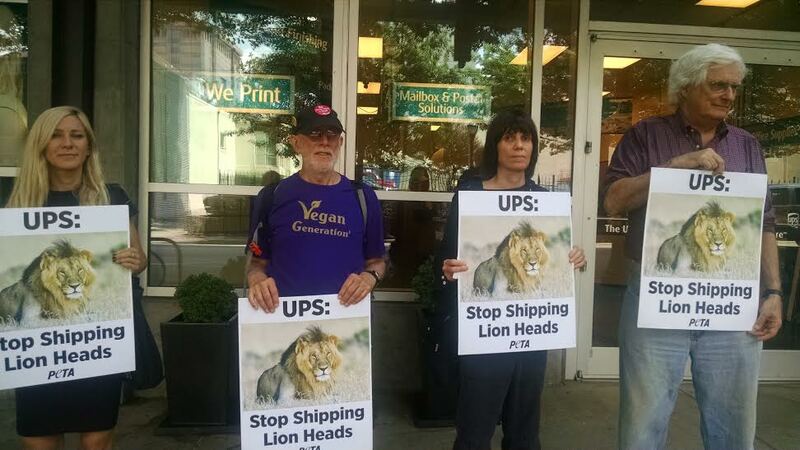 (APN) ATLANTA — People for the Ethical Treatment of Animals (PETA) is pressuring shipping company UPS to stop shipping exotic trophy animal parts, following the recent outcry over the death of Cecil the lion. Walter Palmer, a U.S. recreational big-game hunter killed Cecil, a Southwest African lion, on July 01, 2015, leading to international outcry and debate over recreational hunting. A group of four protesters gathered outside a local UPS store on August 27, 2015 to demand a policy change and to speak with passers-by about the issue during the lunch hour rush. “In the wake of Cecil the lion’s death, people have learned just how inhumane and sick trophy hunting really is. That these tourists are going overseas, paying to have guides track these animals who never have a chance, killing them with high powered weapons that cause them to suffer… Public outcry against trophy hunting has never been louder than it is now and it’s time for UPS to listen,” Ashley Byrne, campaign specialist with PETA, told Atlanta Progressive News. Earlier this month, Delta airlines decided to stop shipping exotic trophy animal parts, including lion, leopard, elephant, rhinoceros, and buffalo. “Prior to this ban, Delta’s strict acceptance policy called for absolute compliance with all government regulations regarding protected species. Delta will also review acceptance policies of other hunting trophies with appropriate government agencies and other organizations supporting legal shipments,” Delta wrote in their press release. “UPS met with a petitioner on Tuesday, and they said they cannot afford to give in to every special interest group. What we are going to show them and what they are going to find out is this isn’t the interest of a special interest group, that it’s the majority of the world,” Julie Robertson, board member of Georgia Animal Rights and Protection, said. However, UPS tells APN they are not moved to change their policies at this time. “UPS will not take on the role of a regulator that determines when a customer may exercise their lawful rights and when they may not. Without the authority of the law guiding UPS shipping policies, the company risks ongoing demands from groups that want to attempt to stop lawful commerce by limiting the availability of shipping services for a variety of products,” Kristen A. Petrella, UPS Sustainability PR Manager, told APN. “If a law is enacted that bans the shipment of taxidermy items, UPS will comply with the law,” Petrella said. I will not use UPS. Think there are many more animal lover’s than there are “special Interest groups”. Especially trophy hunters, who are becoming the most hated group in the world. So CEO not so wise decision making on your part. How to hurt the bottom line, by offending the animal lovers of the world. Yup can understand how you made it into management — NOT!!! Hey why not support the KKK and NeoNazis too, should not help your profits either and will be continuing in the direction you are going in now. Ditto, Mary. Just because something is legal does not make it moral. UPS, stop shipping the remains of brutalized animals.